Cholesterol levels measurement units - what is cholesterol measured in? How does this cholesterol calculator work? This calculator converts cholesterol units form the popularly used mg/dL to the SI units mmol/L. It works for total serum cholesterol, High-Density Lipoproteins (HDL), Low-Density Lipoproteins (LDL), and triglycerides. 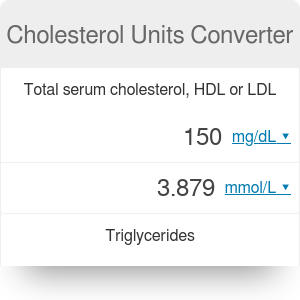 Converting cholesterol levels measurement units by yourself can be overwhelming, so read on to understand how our cholesterol calculator works and what unit is cholesterol measured in. It looks like you just had your cholesterol levels checked. If you're interested in using them to assess your heart disease risks and your general health condition, check out our cholesterol ratio calculator. The American Heart Association (AHA) recommends that all adults age 20 or older have their cholesterol checked every four to six years, and work with their healthcare providers to determine their risk for cardiovascular disease and stroke. Cholesterol is typically measured in milligrams per deciliter (mg/dL). Millimoles per liter (mmol/L) is the standard medical unit for measuring concentrations of substances in blood. It's used in Canada and some European countries. Various publications use either one or the other unit and it can be confusing to understand the guidelines. Our cholesterol calculator is here to help you. To get from mmol/L to mg/dL, you need to multiply by 38.67. To get from mg/dL to mmol/L multiply by 0.02586. To get from mmol/L to mg/dL multiply by 88.57. To get from mg/dL to mmol/L multiply by 0.01129. It's possible that you've also had your glucose level assessed. If you need a hand with glucose units, see our glucose unit converter! Cholesterol Units Converter can be embedded on your website to enrich the content you wrote and make it easier for your visitors to understand your message.